Nature Hatin' Blues is dedicated to hometowns and misfits everywhere, mountains and people who fight to save them, the soil we grew up in…. To a certain degree, the dedication sums up both the album and the band. The music is deeply rooted in the mountains of Appalachia, but is also subject to the ruminations of those who try to escape their steep mountain walls. I am grateful for whatever divine force brought Steph Gunnoe and Sean McCollough together. In addition to their marriage and family, their union has also spawned incredibly beautiful original Americana music…. This follow up to their wonderful debut CD, “Useful,” which included the popular single “Little Thing,” finds the band in a more contemplative mood on “Nature Hatin’ Blues.” ….While “Nature Hatin’ Blues” explores several thorny topics, the songwriting is striking and their delivery is, as always, very moving and very engaging. The Lonetones’ sophomore effort will not disappoint. There is plenty of what we’ve come to know, love and expect from the band, but their contemplative mood on “Nature Hatin’ Blues” demonstrates thoughtful growth in their new work. Diehard fans and new comers will not be disappointed. Top Ten Album of 2006, KDHX Uncontrollable Urge show with boBEE Sweet. Featured on NPR's Website, All Songs Considered. Gunnoe's voice has the sweetness of Nanci Griffith, without the preciousness. It's Appalachian and honest and never overused. 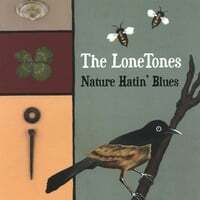 Likewise, her melodies and lyrics are smart, catchy and distinctive...."
Settle in with The LoneTones newest Nature Hatin Blues and a glass of wine or a cup of your favorite tea. It'll make you and your heart smile and say "that's what I was feeling-they played it."